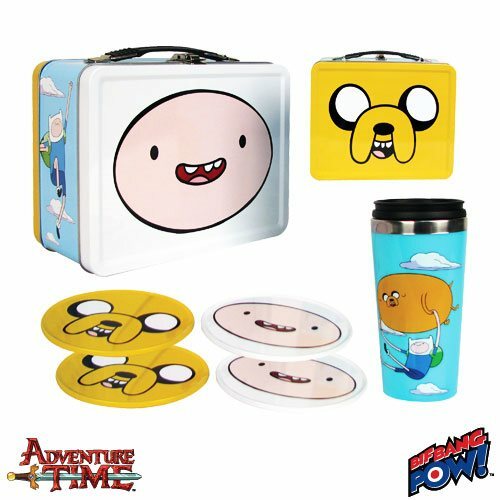 Shopping for Adventure Time Lunch Boxes? Return to the Land of Ooo and the TV series Adventure Time. This exclusive gift set means more fun with Finn and Jake! Entertainment Earth Convention Exclusive! Bif Bang Pow! introduces their first item in their Adventure Time line - and it's an exclusive! What time is it? Adventure Time! The Adventure Time Tin Tote Gift Set from Bif Bang Pow! begins with a colorful metal tin tote box that measures 8 5/8-inches wide x 6 3/4-inches tall x 4-inches deep. It continues with a 16-ounce themed travel mug and a set of 4 coasters that will take you to the Land of Ooo and the animated TV series in a heartbeat. And they all feature delightful images of your pals Finn and Jake! With the Adventure Time logo on the front and Finn and Jake floating in the clouds on the back, the 16-ounce travel mug is fashioned of durable plastic and stainless steel. You'll want to take it with you everywhere! BPA free. Hand wash only. Not dishwasher safe. Do not microwave. Thoroughly hand wash before first use. Set your new mug down on one of the 4 coasters included in the gift set! Made of tin with a cork bottom, two feature Jake's visage and the other two show Finn's face. They measure approximately 4 1/4-inches in diameter. Cartoon Network's Adventure Time is a thoroughly delightful animated television series that follows the adventures of Finn, a 14-year-old boy, and his best friend Jake, a dog with magical powers that enable him to change shape and grow and shrink at will. Finn and Jake live in the post-apocalyptic Land of Ooo.